Many tea producing farmers are expecting the government to fix the floor price of the Nepali tea as their products fetch low prices due to the cartel of traders. Tea farmers also face numerous hurdles such as lack of fertilisers, loans and more. A survey entitled ‘Nepal Commercial Tea Cultivation Survey 2018’ conducted by the Central Bureau of Statistics (CBS), highlighted such issues. The report which was unveiled by the government statistical body on Friday showed that 63 percent of the farmers have demanded the government to fix the minimum support price of the farm product. As of now, the government fixes the price of agricultural products such as sugarcane and rice to relieve farmers from being gouged by the low pricing set by traders. CBS Director Badri Kumar Karki said the large number of farmers enquired in the survey complained that they suffered the cartel of tea processing factories and traders. “As a result the farmers were compelled to sell green leaves, the raw material of tea, for as low as Rs25 per kg against the market price of Rs60-70 per kg,” Karki said. During the survey that the CBS conducted during mid-April 2017 to mid-April 2018, it studied 1,175 samples that included the owners of tea estates, tea producing farmers, factories and traders. Farmers producing tea on at least one ropani of land were consulted in commercial production of the farm product. Similarly, 40 percent of the farmers forwarded their wish list of managing market access by the concerned authority. Failing to receive subsidised loans, management of irrigation facility, availability of modern tools and equipments and easy availability of organic fertiliser and pesticides were among the key demands of the farmers. Nepal produces three types of tea-CTC, orthodox and green tea. Tea is cultivated on 12,067 hectares of land in 14 districts. A total of 9,236 farmers are engaged in commercial tea farming, out of which 5,598 farmers are based in Ilam. The farmers earned an average of Rs1.74 billion annually from selling their product. The survey focused on the study of five main tea producing districts — Ilam, Jhapa, Dhankuta, Tehrathum and Pachthar. According to the CBS, Jhapa is the largest producer of green leaves. With tea plantations spread across 7,195 hectares, the district produces 82,517 tonnes of the raw material. 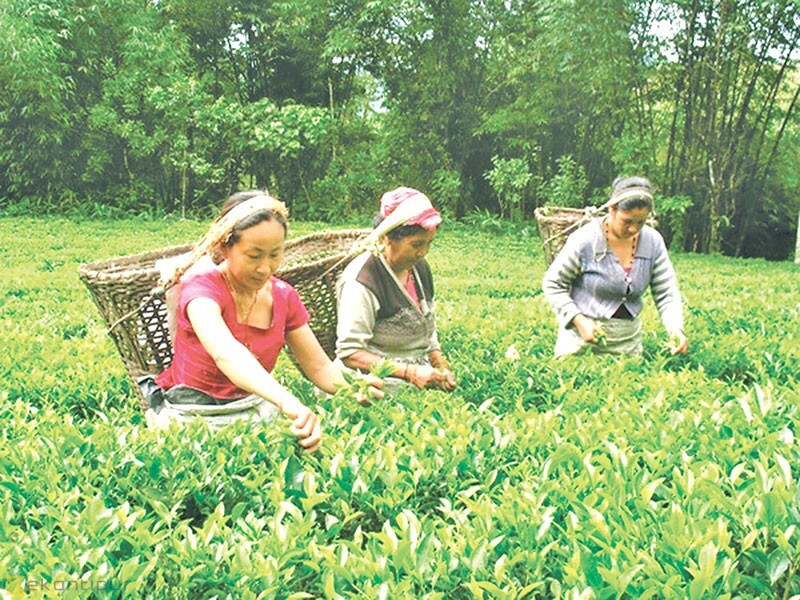 As of now, only 11 percent of the farmers are engaged in producing organic tea, which covers an area of 1,100 hectares. Around 59 percent are still relying on conventional system that uses chemical fertiliser while the remaining have recently started organic farming.